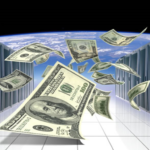 At the end of 2008, I promised a special new year post on SaaS Model Economics 101, so here it is. Introducing the SaaS Scorecard, an online test to estimate the competitive advantage of your software-as-a-service business. 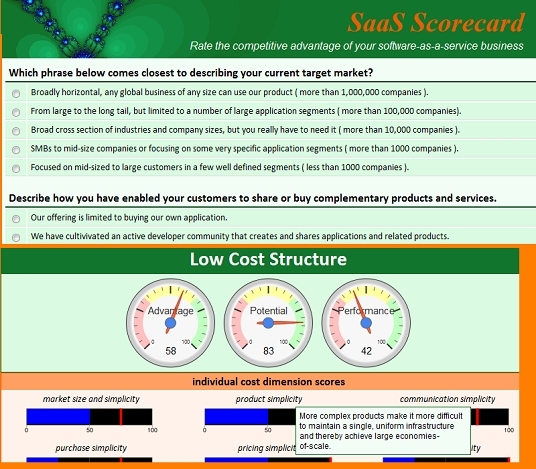 Click on the image above to go to the SaaS Scorecard and take the test. The SaaS Model Scorecard is designed to help software-as-a-service entrepreneurs and investors evaluate the competitiveness of their businesses relative to licensed software and other SaaS competitors using the principles of SaaS Model Economics 101 and the Top Ten Dos and Don’ts of SaaS Success. Every attempt has been made to create a test that accurately reflects these economic principles, however, the goal is simply to provide feedback as opposed to analysis. That is, it’s really just a game. Have fun! 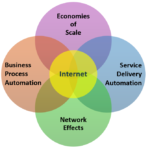 Scores are calculated across 20 key business dimensions that impact low cost advantage, differentiation, adoption costs, switching costs and network effects. For each dimension, a score is calculated for the potential competitive advantage that can be achieved, the current performance of the SaaS vendor in achieving it, and the combination of potential and performance resulting in the actual competititive advantage that is realized.